This is my first blog post — I hope it will not also be the last! The ‘Foothills’ are nestled into the Berkshires, the large mountains in SW Massachusetts; large only to those of us who live here, I suppose. 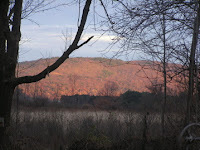 I am in NW Connecticut, where the foothills keep trying to fall away into the piedmont. I can see a mountain from my backyard — therefore I claim to live in the foothills. There is no ‘Folly’ in the backyard yet, although the idea of one being built there is strong. Perhaps it is my life that is the folly. 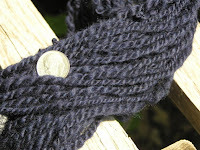 I run a picture framing business and gallery; I paint, hike, garden, knit and spin; I love road trips and reading; I’m thinking this blog will focus on spinning and knitting, but who knows. This is my first homespun, spindle spun, thick and chunky— oh, I guess that is called bulky. I must learn how to do links. This entry was posted in backyard, Follies, spinning. Bookmark the permalink.